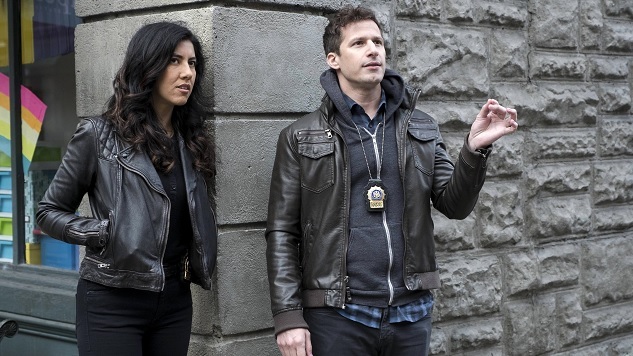 Brooklyn Nine-Nine Review: "Cop-Con" and "Chasing Amy"
I’ve often said, or implied, or insinuated, or intoned, or whatever the hell you prefer to call it, that I would in most cases rather watch an average episode of Brooklyn Nine-Nine than what passes as a “good” episode for most other sitcoms. Having sat through both “Cop-Con” and “Chasing Amy,” the first in a series of double-headers to round out the show’s fourth season, I’m thinking I may need to reconsider that old assessment, because by now it’s likely as overbaked as the mother dough setting by Gina’s space heater. Don’t be alarmed; I still love Brooklyn Nine-Nine, and you should too. Both “Cop-Con” and “Chasing Amy” make for solid entertainment, even if they don’t make a ton of sense paired up as a two-fer. The fault, really, lies with “Moo Moo,” last week’s phenomenal installment and a pretty damn hard act to follow for any episode, a good episode, even a very good episode, which puts this week’s duo in a rough spot. As a consequence, we’ve all been set up for disappointment. Seven days ago, the audience was treated to a smart, concise, poignant comic treatment of one of the most pressing social issues of the era. Now, we’re back to good, old-fashioned 9-9 antics. This isn’t exactly strange, per se, or even unwelcome, but how can we not feel let down by the sudden return to goofball hijinks after a detour into the waters of topicality? Maybe a mention of last week’s events would help offset the 180 taken in “Cop-Con” and “Chasing Amy.” On the other hand, maybe that kind of gesture would just lack basic grace and decency. Either way, we’re back to basics, and if Brooklyn Nine-Nine is good at doing anything, it’s making the basics work. What’s missing is the connective tissue, something to link “Cop-Con” to “Chasing Amy” beyond thematic residue. In “Cop-Con,” Holt and the crew head to exotic Rochester, New York, for a law enforcement convention, where Holt expects them all to be on their best behavior and competes with an old colleague (played with the smarmiest charm by who else but Andy Daly); in “Chasing Amy,” Amy prepares for the Sergeant’s Exam and in so doing drives herself straight-up cuckoo. If we’re being fair, there is a bit of resonance here: Holt’s ambitions in “Cop-Con” mirror Amy’s in “Chasing Amy,” which feels, perhaps, unintentionally appropriate given their status as mentor and mentee. (Hell, you can even throw some rope back to “Moo Moo,” and use Terry’s drive for career advancement to tie all three together.) But it’s difficult to go from “Cop-Con” to “Chasing Amy” without scratching our heads and wondering over the decision to run them one right after the other on the same evening. These are episodes that’d do just fine with the distance of a week separating them. They don’t need to play together. Are we just trying to fill up space here as the show heads toward its season finale? Grant that none of this reflects on the quality of either “Cop-Con” or “Chasing Amy,” and that both of them work perfectly well on their own merits. Grant also that there’s a reason we slap a waiting period between individual chapters of episodic television. When you’re talking about a Westworld or a Game of Thrones, that waiting period is torture. When instead you’re talking about a sitcom like Brooklyn Nine-Nine, it’s a necessity. The goofy laughs of “Cop-Con” and the plot-driven chuckles of “Chasing Amy” don’t relate to each other, and they would benefit a great deal from the distance that the majority of Brooklyn Nine-Nine’s episodes get to enjoy. The blessing is that they’re worth watching. “Cop-Con” builds up to an unexpected swerve in its credit sequence, and spends the bulk of its time letting Jake, Terry and Boyle be detectives in a Hangover-style scenario; meanwhile, “Chasing Amy” has Jake and Rosa pursuing Amy as Holt and Terry bicker over model trains and Gina and Boyle squabble over family heirlooms, which, being the heirlooms of the Boyle clan, are incredibly strange. (At least it means the return of Christopher Gehrman as Cousin Sam. We love him!) After seeing Boyle and Jake gear up for the climax of “The Last Ride,” watching the gang run around like a pack of kids in a candy store in “Cop-Con” is good fun, dovetailing nicely with the eventual raucous shenanigans that unfold in Jake’s hotel room as they throw the convention party to end all convention parties. You’ll kind of wish you were there with them, even if Terry ends up lighting Jake on fire, Scully ends up in a body bag (he’s fine, don’t worry), Amy ends up barfing in a pillowcase, and Jake ends up making an impromptu shirt out of a pillowcase. But it’s hard to get past the packaging here. There’s no reason either of these should follow the other, and smushed into one block of TV, they clang together. Most of all, it’s just a bummer to see one of Brooklyn Nine-Nine’s most arresting plot threads unceremoniously left behind, with no real impact on the overarching character of the show. It’s true that the cast has endured a lot this season, from the threat of shutdown to working the nightshift, and in acknowledgment of that, it’s possible that we should be forgiving: It isn’t a crime to take a break from serious narrative trajectories with fart-fives and talk of eight-drink Amy’s horrific equestrian skills. But if we never revisit “Moo Moo” and its fallout, it’ll be a massive goddamn shame. Boston-based critic Andy Crump has been writing about film online since 2009, and has been contributing to Paste Magazine since 2013. He writes additional words for Movie Mezzanine, The Playlist, and Birth. Movies. Death., and is a member of the Online Film Critics Society and the Boston Online Film Critics Association. You can follow him on Twitter and find his collected writing at his personal blog. He is composed of roughly 65% craft beer.